What an Arctic blast we’ve had this week! With the drastic cold temps outside I feel fortunate to be inside keeping warm. The ironic thing is that both Josh and Cameron are off on their own adventures this week and my hyperactive Mom senses have kicked in, worrying about them in this wicked weather. Hopefully by the time I have posted this they will both be back home and my worries will have been for naught. With only Joe and I home this week, I’ve been using up what’s left in the fridge and pantry. I had a few bananas getting overly ripe and needed to be used pronto so I made a loaf of banana bread. 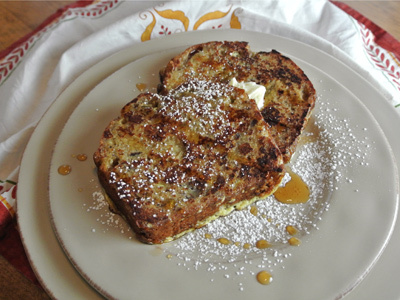 A slice of banana bread is so good toasted for breakfast and as it turns out it makes a great french toast. It’s a sweet treat for breakfast or in our case a quick dinner. 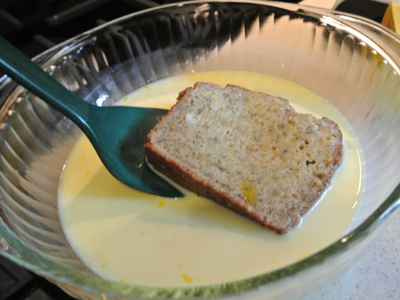 It starts with your favorite recipe for Banana Bread. 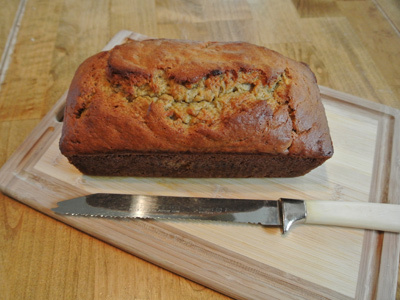 I’ve tried several different versions of banana bread but this loaf was made with butter and applesauce instead of oil. Slice it thick unless you like thinner french toast. This amount of egg bath made 6 slices of french toast. I combined 2 eggs, 1/2 cup half and half and a pinch of salt. 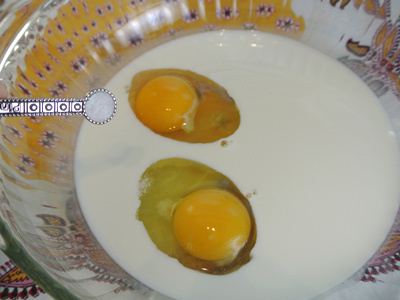 Whisk the mixture and then dip each slice into the egg bath. Let sit a few seconds on each side, enough time to let it soak slightly into the bread. Heat a griddle and melt a pat of butter. 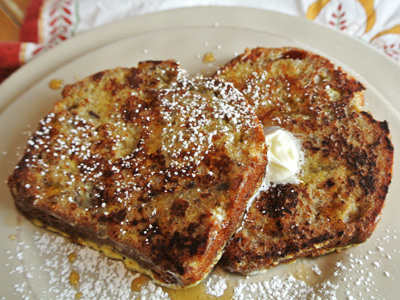 Set the toast on the hot griddle and let cook until the toast has browned on the bottom. Flip the toast and brown on the other side. Probably takes 2 – 3 minutes on each side. Serve it up with some whipped butter and maple syrup. Maybe even some banana slices on the side. Whisk together eggs, half and half and salt together in a medium bowl. 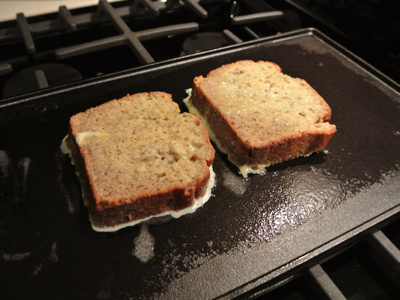 Dip slices of banana bread into the egg bath and let soak a few seconds on each side. 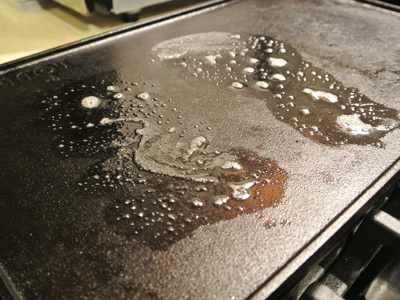 Heat a griddle and melt a pat of butter over the griddle. 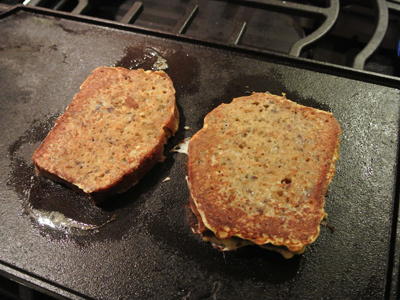 Set the slices on the hot griddle and let cook 2 – 3 minutes or until browned. Flip the toast over to cook the other side. 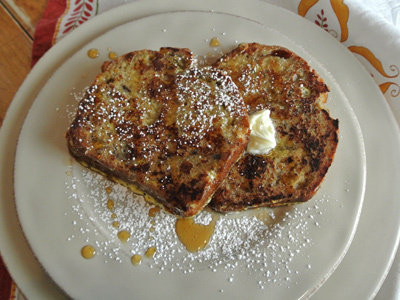 Serve toast with whipped butter and maple syrup and a sprinkle of powdered sugar. Combine dry ingredients of flour, baking soda, baking powder, and salt together in a medium bowl. In the bowl of a standing mixer, combine sugar and melted butter. Blend in the eggs one at a time, then add the vanilla and applesauce. Alternate adding the dry ingredients with the mashed bananas scraping the bowl between additions until you have a light batter. Grease a loaf pan with butter. Pour batter into a loaf pan and bake in a preheated 350 degree oven for 1 hour. Test with a toothpick and if needed cook up to an additional 10 minutes, checking every 5 minutes for doneness. 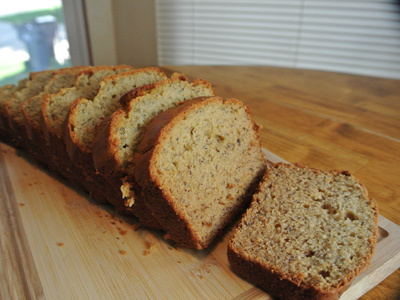 Let banana bread cool on a wire rack before slicing.